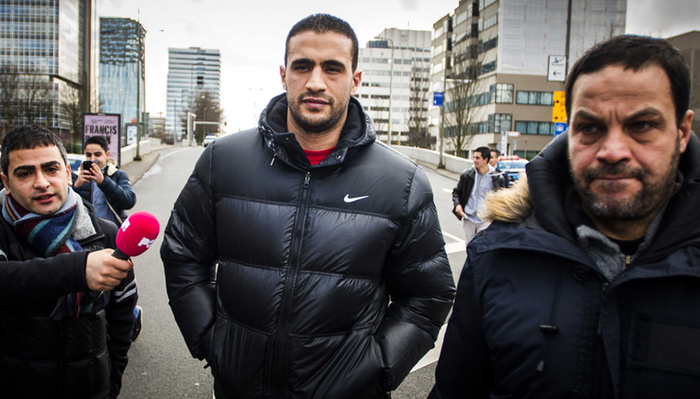 Last week former K1 heavyweight champion Badr Hari landed himself with a prison sentence for yet another assault against an innocent bystander. But, it appears that didn’t keep him on the straight and narrow. According to the Moroccan press, the below video purportedly shows the six foot six kickboxer in Casablanca aggressively approach an innocent hotel receptionist before slapping him just days before sentencing in the Netherlands. The Amsterdam-raised fighter had recently hit the headlines in a less sinister way as he grabbed headlines across the world when gallivanting with soccer superstar Cristiano Ronaldo at various Moroccan resorts. However, Hari has a well-earned reputation of being a self-admitted hot head with eight criminal charges of violence to his name—hence earning his badboy moniker. These include assaulting his ex-girlfriend Rosa before damaging her property on July 9th 2011. Eight days later, Hari was accused of beating up the owner of Club Air and an Italian patron. The incident that led to Hari’s sentence happened in 2012 when he attacked Dutch millionaire Koen Everink at a dance event in Amsterdam. Everink sustained a broken nose, a fractured eye socket, a broken ankle and some leg injuries from Hari’s vicious assault with numerous other attendees witnessing the savage assault. Hari only handed himself into the authorities through fear of being arrested by a SWAT team. The resulting sentence of two years in prison and a 37,326 Euro settlement seems a little soft considering ten months of that term have been conditionally suspended and as Hari has already spent six months in the custody of the Dutch police, he will only be imprisoned for up to eight months proper. That’s not ideal for Everink, who is still suffering mentally despite most of his wounds having healed—though his ankle has not yet fully recovered. Hari has since offered his unreserved apologies to Everink and the pain he has since endured. However, if the Moroccan press and their video of yet another assault in the Casablanca hotel is to be believed, those words appear to be somewhat hollow. With all of his legal issues swirling around him, Hari has only (legally) fought once in 2015: a third round TKO victory over Surinamese scrapper Ismael Londt back in August. He was slated to fight Romanian Cãtãlin Moroșanu later this month in Dubai, but whether that happens or not depends on the timeline of the big Moroccan’s upcoming prison sentence.